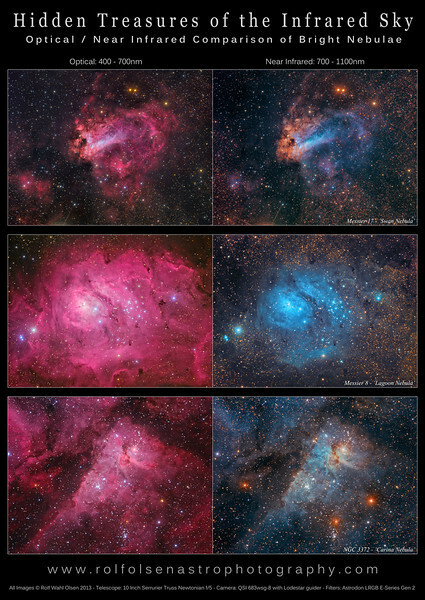 This poster features images from my series of optical/infrared comparisons of famous nebulae. Traditional images of emission nebulae taken in visible light primarily display the striking magenta colour from glowing Hydrogen gas, as well as large dark obscuring clouds of dust. The infrared part of the spectrum penetrates these clouds better and reveals complex details and thousands of young stars that are otherwise completely invisible. These stars shine primarily in the infrared and appear as golden red in these images. Only a minority of these are visible in traditional optical images. To create these images I used a special infrared filter. Effectively the band observed is 700-1100nm since the silicon CCD chip is not responsive to wavelengths longer than that, and this band is called NIR (Near Infrared). One issue arising from this technique is that the NIR band does not have a colour as such, since it lies outside the visible light spectrum. To create a colour image from the NIR data I have developed a colour stacking technique which has produced promising results so far.